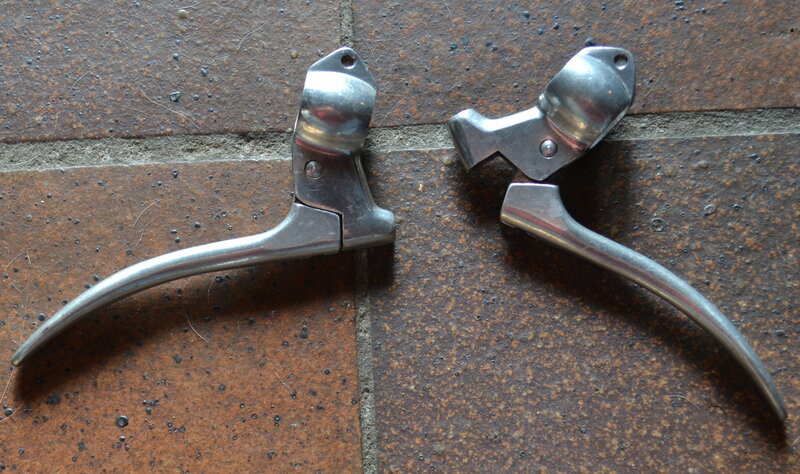 Anybody recognize these brake levers? Not the first time I'm asking this question, but I'm a sucker for nice bits of aluminum. 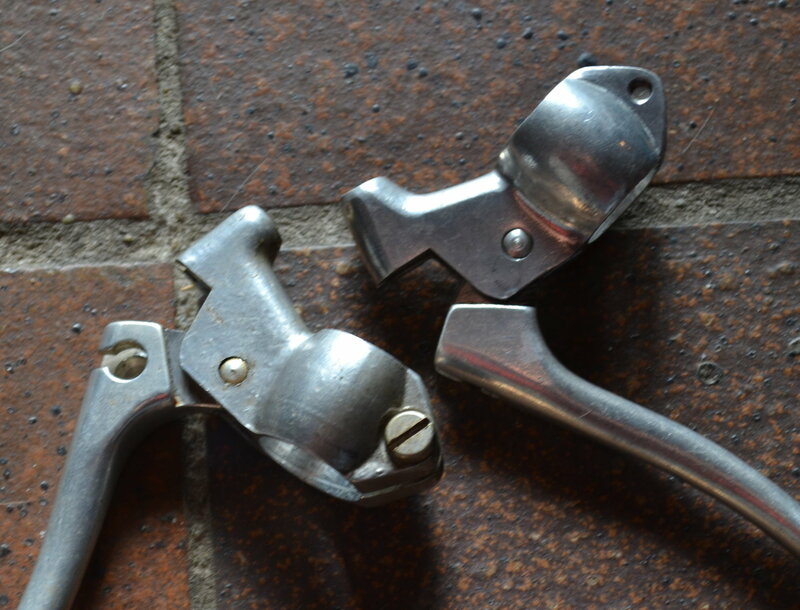 And for some reason especially nicely-made brake levers make me go all weak in the knees. So when I saw these at today's bike jumble I had to have them. I haven't found any markings. At all. The outsides are nicely polished, on the insides the finish is slightly rougher. What size bar does it clamp to? I am thinking 22.2, but with the slotted screw it may be larger. Never seen them. Very cool. 22.2 seems right. I seem to have misplaced my calipers, but I tried them on some bars I had lying around. They fit most, except the old Philippe bars, which I assume are the old French 23.5mm size. One characteristic - or drawback if you like - is that they require a perfectly straight tube, so no mounting them on or even near the bends. If they are 22.2 they could be motorcycle levers. The flattened elongated spoon shape of the lever (lacking a ball end also) reminds me of '60s BMWs. Are the screws metric or American or Whitworth? This could provide a clue. Early mountain bikers were known to use motorcycle levers, and some were even sold in cycling catalogs, so this might be a possibility even if they were taken off a bicycle. One other thought is that if they're motorcycle levers from a bigger motorcycle, the cable hole in the lever may be for a larger diameter cable with a larger sized end. Smaller motorcycles and mopeds often used standard-ish bicycle cables. Last edited by scarlson; 04-15-19 at 05:27 PM. That possibility occurred to me, as I was searching for "leviers ancien" and quite a few moped and motorcycle levers turned up. These are not particularly big or bulky so I would not expect them to have come off a big machine. I was thinking moped or small motorcycle levers too. I used some on my first off road trekking bike that I built in 1976. Drop bars were too hard on the hands and shoulders during steep fast descents on narrow rocky single tracks so I switched to uprights. Wimpy Weinmann upright levers didn't cut it. The MC levers were great. I think that they may have been from a small Aeromachi. I also got some nice large diameter gum rubber grips off of some Italian MC or Scooter. They were at least 45mm in diameter and easy on the hands.